Most of the dye washed off with the hot water. Is this because I didn't do the dyeing properly? 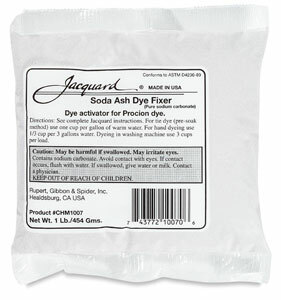 Soda ash fixes Procion dyes to cotton, rayon, or silk at room temperature, with no need for hot water that will melt your wax. These tools are for applying wax in fine lines. Message: Hi Paula, I contacted you a few months back about batiking a Cuban flag. Your information was very helpful and although I'm still tweaking my techniques the projects are getting better. My question (I haven't been able to come up with a definitive answer in the forum) is about removing the wax after dyeing. I"ve tried the ironing method but it leaves a waxy shade around the batiked area. I tried boiling the garment (I'm working with white tshirts) but most of the dye washed off with the hot water. Is this because I didn't do the dyeing properly? I am using the low immersion process with the soda ash. I have found your forum to be very helpful. Thanks for devoting your time to help confused people like me achieve some knowledge of this art medium. Something must have gone wrong in the dyeing process, if most of the dye washed out, leaving little color behind. Fiber reactive dyes are very good at resisting very hot water, even when boiled, if they have been fixed properly. The first question I must ask is, what kind of dye are you using? All-purpose dye, for example, such as Rit brand dye, will not work for batik, because it inevitably washes out in hot water. You must use fiber reactive dye; the most popular type of this dye for hand-dyeing is Procion MX dye. Since you are in Colorado, a good source for fiber reactive dye is Colorado Wholesale Dye, also known as Grateful Dyes. 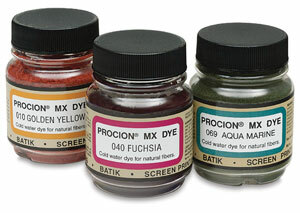 Their dyes are all Procion MX type fiber reactive dyes. They are located in Littleton, Colorado, and do most of their business by mail-order. Other good sources for dyes are on my page "Sources for Dyeing Supplies Around the World". There are other things that can go wrong even if you are using the right sort of dye, but they are less likely. You need to make sure that the dye is reasonably fresh, because dye that is too old will spoil and will not be able to attach to the fabric. It will usually last for at least a year or two. Sometimes, though not very often, a craft store will sell old dye that has been on the shelf for so long that it is no longer good. The dye needs to never have been exposed to high heat, such as being left in a car with closed windows on a sunny day, because high heat can spoil the dye quickly. The soda ash has to really be soda ash, and not, for example, mislabeled baking soda or urea. Fiber reactive dye has to be dissolved in room temperature water, not in boiling water, and, if you choose to mix the dye with the soda ash, it should not be mixed with the soda ash until just a few minutes before you apply it to the fabric. The fabric can be a problem, also. Polyester will not work; look for 100% cotton, or 100% rayon or silk. Do not ever use stain-resistant or water-resistant fabric or clothing, because they will resist the dye, as well. Even if you use the right sort of dye, and do everything else right, it doesn't mean you won't see dye come out of the fabric, though. Some of the dye does not attach, and has to be washed out; it can be rather alarming to see how much dye appears in the wash water, even when the dye has been properly fixed. This is to be expected. Quite a lot of washing is required after dyeing with reactive dyes. Your first washing should be done with cool water; don't use detergent in the first washing, unless you have Synthrapol, which is okay even in the first washing. Before boiling out the wax from batik, it is good to remove as much dye as you can with water that is not hot enough to melt the wax. Even after washing out as much dye as you can using cool water, more dye will come out into hotter water, but it is more convenient to remove as much dye with cool and warm water as you can, before boiling. Boiling is in my experience the best way to remove batik wax. I like to add a small amount of real soap, not detergent, to the water used to boil out the wax. You don't actually need to reach temperatures as high as boiling, as the wax will melt and float to the top when the water is hot but not yet simmering. The fabric should be submerged so the it is not touching the surface of the water where the wax will collect. Let the water cool so that the wax solidifies before you remove the fabric. You can avoid the bother of boiling out the wax by using a product called soy wax instead of batik wax. Soy wax is not quite as durable on the fabric as batik wax, but it is good enough most of the time, depending on what you are doing, and it is much less trouble to remove. Soy wax can be removed in water that is 140°F (60°C), if you use enough detergent to suspend the wax so that it does not deposit in your plumbing. I advise against removing soy wax in a washing machine, because it's harder to tell whether you have used enough detergent, and you don't want to get hardened wax into your pipes. I advice removing soy wax in a bucket of very hot water, checking the temperature of your tap water to make sure it is at least 140°F. After the soy wax has come out of the fabric, wash it in a washing machine as usual.